We stayed at Barnby Dunn yesterday. As you can see from the pic above taken at mid-day the weather was threatening a good soaking for us if we left. The weather this morning was more settled. It was all grey and cloudy but not about to rain I thought. 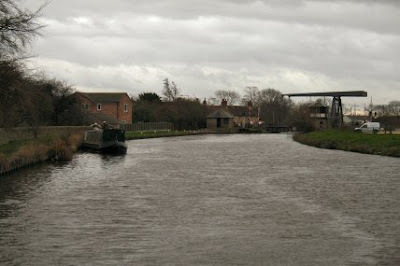 The canal at this part of the bend is about 65 feet wide and with the wind blowing this way the boat was turned around quite rapidly and we head for Bramwith. There is not a lot of room to spare over 60 foot at the top of the lock for mooring to open up but it is rather nice to use the old style paddles again. Tim closed up for us and is still next to the lock. I opened up the Bramwith lift bridge and here the wind is blowing from the right which doesn't help. 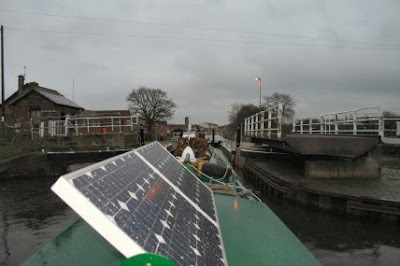 The mooring on the other side is really short and Tim couldn't get on so I closed up. On the way down I had the Walkman on and listened to various albums but liked the Christmasy Three Tenors CD. 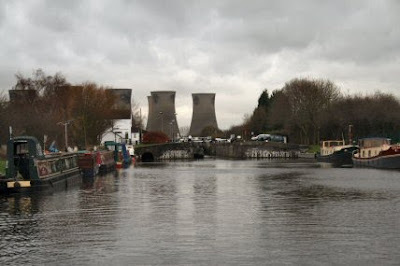 Tims turn to open up and as I enter the lock it starts raining. Within minutes it is belting down and luckily for us we have only a little way left to go. 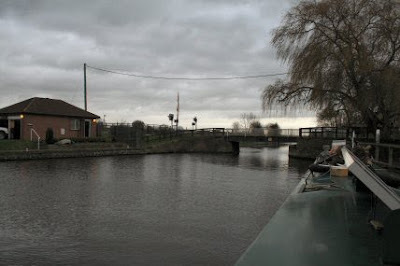 As I leave the lock to close up the wind catches me and I couldnt get on the mooring so Tim does the business. 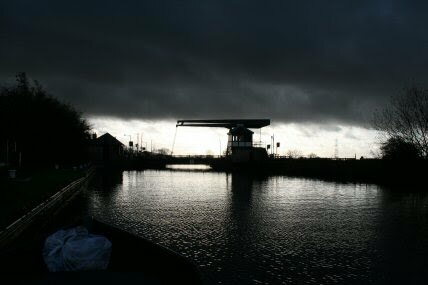 By the time I reach the mooring which is ten minutes away it is quite dark and about ready for headlights if it had been further. You could be forgiven for thinking that your first photo was taken in black and white!